HTML5 is a new version of the language HTML, with new elements, attributes, and behaviors, and a larger set of technologies that allows the building of more diverse and powerful Web sites and applications. Amazing Video to HTML5 Converter software allows users to convert different video formats to HTML5 (WebM, MP4, OGG) and Flash (MP4). It supports all popular web browsers, such as IE, Firefox, Apple Safari, Chrome, Opera and so on. 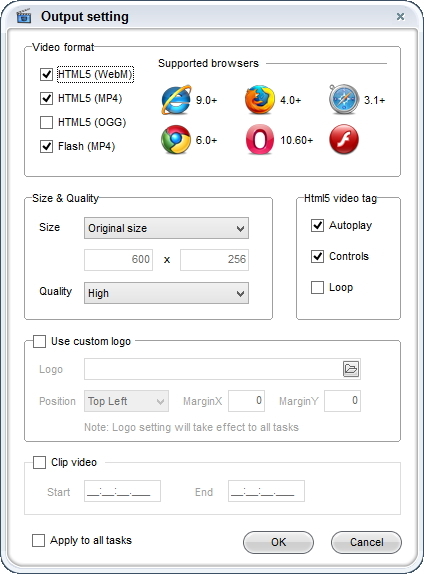 Many video formats can be converted to HTML5 including AVI, WMV, FLV, MOV, RMVB, MPG and MP4. Before converting video to HTML5, you are able to clip your favorite sections of a video, personalize your video with picture and text watermarks, html5 video tag config and command line conversion. 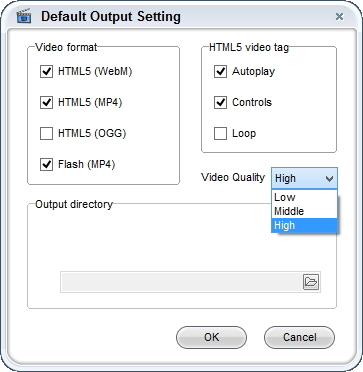 3 steps of converting video to HTML5 video: step1, launch Amazing Video to HTML5 Converter software on your computer; step2, import video files and choose html5 video format; step3, click "Convert" button to start Video to HTML5 conversion. Clement - Best and free solution to convert video to HTML5. Edith - It is a fast and easy way to convert my MP4 to HTML5 WebM video with no quality loss.